Please note that the content of this book primarily consists of articles available from Wikipedia or other free sources online. 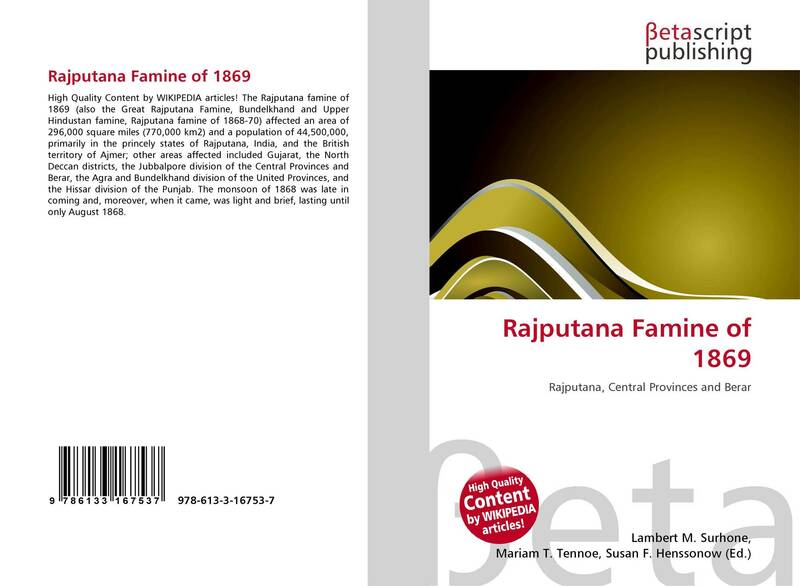 The Rajputana famine of 1869 (also the Great Rajputana Famine, Bundelkhand and Upper Hindustan famine, Rajputana famine of 1868-70) affected an area of 296,000 square miles (770,000 km2) and a population of 44,500,000, primarily in the princely states of Rajputana, India, and the British territory of Ajmer; other areas affected included Gujarat, the North Deccan districts, the Jubbalpore division of the Central Provinces and Berar, the Agra and Bundelkhand division of the United Provinces, and the Hissar division of the Punjab. The monsoon of 1868 was late in coming and, moreover, when it came, was light and brief, lasting until only August 1868.